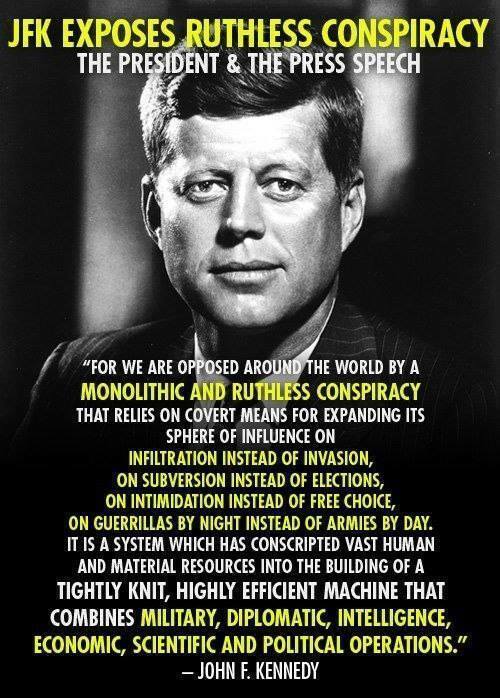 John F. Kennedy was entirely right about the CIA … and that was back in 1961. Imagine how much worse the global CIA-run tyranny is in 2017, 56 years later. In addition to brutally murdering the American president, how many other heads of state have been summarily assassinated by the Central Intelligence Agency? Not only did the C.I.A. coordinate every aspect of the assassination of President Kennedy, they have continued to oversee a highly complex and effective cover-up since November 22, 1963. The C.I.A. painstakingly set up Lee Harvey Oswald as a patsy because he had warned JFK and his brother of a previous assassination plot in Chicago earlier that same month. Not only did the C.I.A. frame Lee Harvey Oswald because he was actually working for Attorney General Bobby Kennedy, they also killed John F. Kennedy, Jr. to maintain the ongoing cover-up … after they killed Robert F. Kennedy on June 5, 1968. It’s true that JFK, Jr. was very close to outing George H.W. Bush as the CIA’s point man in Dallas on the day of President Kennedy’s Assassination. He even named his iconic magazine — GEORGE — after the elder Bush assassin. 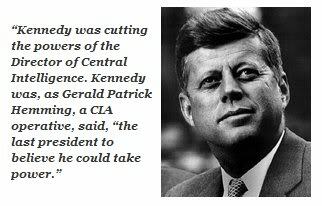 Now the world knows why President Kennedy was so determined to “splinter the CIA in a thousand pieces” as his own son would eventually be murdered by the same rogue elements in The Company, as would his brother be conspiratorially killed by them. Which is why President Trump must act to dissolve the whole God-forsaken group of C.I.A. spooks and swamp monsters. Trump really has NO choice in the matter: It’s either him or the C.I.A. There is not room in the USA for both. In fact, there is only room for one — either the Trump Administration or the CIA — on the planet during these extremely transformative times. That’s because the C.I.A. will only run interference 24/7. That’s what the CIA’s predecessor the OSS (Office of Strategic Services) was originally set up to do. Kennedy’s fatal mistake was that he really believed he could rid the world of the C.I.A. without a massive display of people power behind his direly needed initiative. 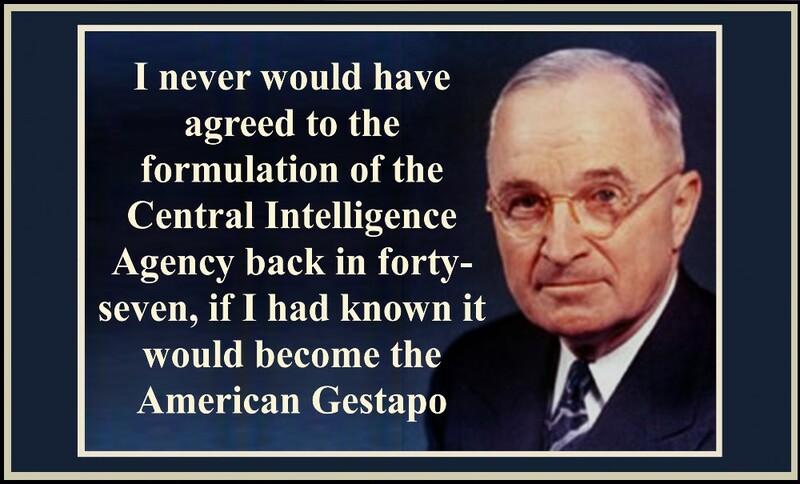 However, by unwittingly setting himself up for the most public presidential assassination in U.S. history, he ended up exposing the true workings of the C.I.A.—BIG TIME! Now it’s time for another agent of change — Donald J. Trump — to defund and defang what is essentially a worldwide color revolution platform. Besides carrying out assassinations around the world over several decades, the C.I.A. is really just a coup factory. Their specialty has become starting civil wars and executing coup d’états, inciting color revolutions and implementing government overthrows. Most are completely unaware, but the ongoing Purple Revolution here in the USA, that is headed by Barack Obama, Hillary and Bill Clinton and funded by George Soros, is just another classic color revolution. See the purple colors that HRC wears now at very public events in the rare case that she attends them. It’s no coincidence that CIA Director John Brennan assumed his leadership position on March 8, 2013. That gave the Muslim CIA director (How many born Irish-Catholics do you know who first convert to Islam, and then rise to become Director of the Central Intelligence Agency?) just enough lead time to set up the entire Northern Levant so that ISIS would be given free rein of the territory … until Putin’s Russia showed up to rain on their parade of terrorism. Only on this parade, it was bombs and missiles that fell from the sky. The Kremlin has known all along that the very purpose behind the rapid proliferation of ISIS terrorism by the Zio-Anglo-American cabal was to set up the Mideast terrain for the completion of the Greater Israel project. However, Russia was neither amused, nor would they be cooperative. The crucial point here is that the Obama Administration first let loose the ISIS and Al-Nusra terror groups across the Northern Levant so as to perpetuate the fake Arab Spring color revolutions. Then Obama & Company created Black Lives Matter stateside as a homegrown terror organization to implement their own domestic Purple Revolution. This ongoing Purple Revolution against Team Trump has all the hallmarks of a classic C.I.A. black operation. They use violence whenever their more stealthy tactics fail to deliver the planned outcomes. Disruptive riots and out-of-control protests were used against Trump during the campaign season, just as they are planned for Inauguration Day. Black Lives Matter: America’s Homegrown Version of ISIS? Sitting squarely behind all of these seditious schemes to overthrow democratically elected governments and destabilize sovereign nations is the C.I.A. They are at the very core of every criminal conspiracy to incite unlawful and barbaric revolutions around the globe, as well as to carry out soft coups when far less muscle will do the job. CAVEAT: The C.I.A is now aggressively operating on every square inch of all 50 states, which represents a very direct and institutional reaction to the election of Trump. The election result was not supposed to happen according to the all-powerful Deep State, so the C.I.A. rank and file have been given orders to execute the ongoing coup d’état. First a soft coup is now occurring in real time; then a hard coup should the C.I.A. still be in the position to conduct one. Yes, this is most definitely a race against time—for both sides of this unparalleled and epic conflict. The C.I.A. under Obama knew that it could get away with anything — A N Y T H I N G — it wanted to, so much stuff did they possess to blackmail and coerce the imposter POTUS. Perhaps it was even the C.I.A. that was directly responsible for fabricating and posting Obama’s fake, forged birth certificate copy at WhiteHouse.gov as a modern-day Sword of Damocles. This is how the C.I.A. compromises very important people in power to carry out The Company’s implementation plans designed at their headquarters in Langley, Virginia. Which is why Obama has overseen the worst presidential transition in American history. Which is also why the Clinton Crime Family is still on the loose carrying out their traitorous agenda wherever and however they so choose. The now notorious and numerous Clinton crime sprees were all conducted with the imprimatur of the C.I.A., so what do they have to worry about. You can’t indict a CIA stooge who was gun-running in Libya while Secretary of State Clinton was arms trafficking in Syria. How else to coordinate an illegal and genocidal war against Syrian President Bashar al-Assad except with close collaboration between State and the C.I.A. The MO of the C.I.A. The C.I.A. is all about media manipulation and naked propaganda when they’re not droning innocents with missiles and/or dropping bombs on wedding parties and funerals. It must be understood that this C.I.A. crowd is fundamentally a gang of criminally insane psychopaths. They will do whatever Deep State tells them to do as the more distance from the decision-makers and the scenes of the crimes makes it easy for everyone to simply do their nefarious jobs. That’s why funerals and weddings are often chosen to implement their extrajudicial assassinations of alleged Muslim terrorists, who also happen to be very traditional and certain to pay their respects accordingly. The C.I.A. knows they can murder their suspects on such special occasions, even if it means taking out a whole LOT of other collateral damage (e.g. innocent human beings who happen to be in the way of a missile). 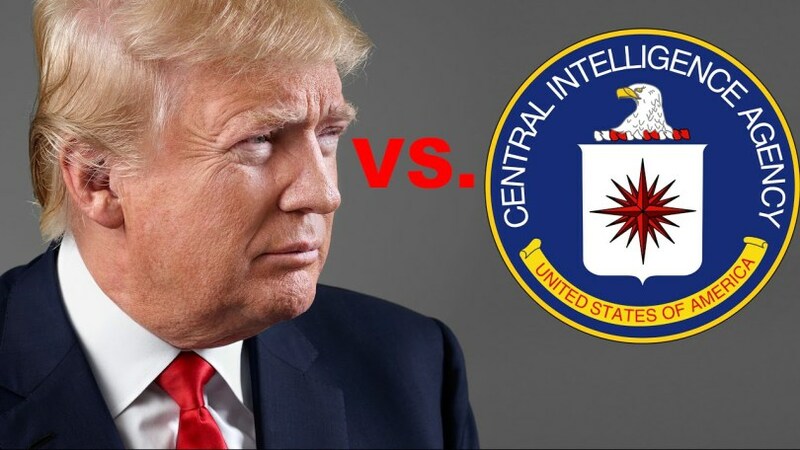 The 16 or 17 agencies, which make up the United States Intelligence Community, are all participating in this coup against Trump because they all have skin in the game. The controllers at the top are always sure to involve all the agencies so that there is unanimity of official opinion, as well as the common purpose to sow seeds of chaos in a future war zone. As a matter of historical fact, each of the so-called revolutions that continue to define the U.S.-manufactured Arab Spring were fastidiously engineered by the C.I.A. Yemen is only the lated battleground and war on civilians that has been waged via a typical CIA-directed proxy war. In this case, Saudi Arabia has been armed to the teeth to demolish the much less armed Houthi rebels. Just like the MOSSAD, the C.I.A. adheres strictly to the following tactical dictum. However, when the C.I.A. wages war against the American people and their future president, they know that they must be extra stealthy and deceptive. Technically, the C.I.A. is prohibited from carrying out any operations on U.S. soil as the relevant law was written to preclude exactly what The Company is doing to The Donald at this very minute. And, it’s quite clear that they will not cease and desist from their treacherous plots until they are ignominiously shut down. By the way, Kennedy was not alone in his detestation of the C.I.A.